Loads of Vans – located in North Cheam, Surrey – has hundreds of vans in stock at any one time. Our selection is made up of models from various trusted brands including the full selection of new Vauxhall vans available at competitive prices. Whether you’re a sole trader in need of a single van, or a transport manager in search of a fleet for your team, you need look no further than the range of new Vauxhall vans we have on offer. With a range of lengths, wheelbases and configurations on offer, you can choose the perfect Vauxhall van to suit your enterprise. There’s the highly flexible, agile Corsavan which has been adapted from the popular Corsa passenger car, as well as the compact Combo van also available in Sportive Crew van configuration. 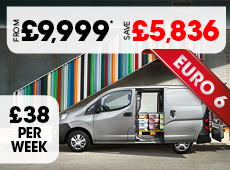 Move up to the mid-sized vehicles and you have models such as the Vauxhall Vivaro van. The heavy-duty Movano van (also available as a dropside version) is the largest of lot and can make light work of shifting huge loads. When you come to us, you can also take advantage of our flexible finance deals, which can be tailored to suit your needs and those of your business. Finance lease and hire purchase options are also available, and our team of experts is on hand to help in any way you require. You can view the complete collection of new Vauxhall vans below. Click on an individual model to find out more about it and view our current special offers. If you have any questions, don’t hesitate to get in touch – we’re open seven days a week.